This is still not everything! *I was sent a Mighty Handle to review. All opinions and mounds of stuff for our activities are my own. We have a few days in the week where the paraphernalia of all the extracurriculars can take a couple of trips to the car to load up. If only someone would come up with a way to transport it all at once...oh look, someone has! Sometimes, most of the time, the simplest ideas are the best ones. Take for instance this little doohickey. 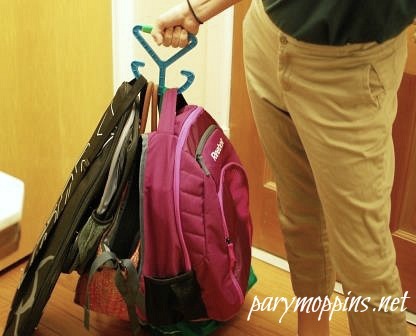 It's called the Mighty Handle. Don't be fooled by its simplistic design, it is small but definitely mighty. I really like its anchor shape which keeps the bags from slipping off of it. And all that stuff up there on the couch fit with room leftover. The Mighty Handle can, uh, handle bags up to 50lbs. in weight, although I'm not sure I can. What this little baby does, besides consolidate your trips, is take pressure off of your hands. Heavy grocery sacks can dig into your hands or cause them to cramp, but the Mighty Handle is comfortable and the weight is distributed evenly instead of digging into your palm. 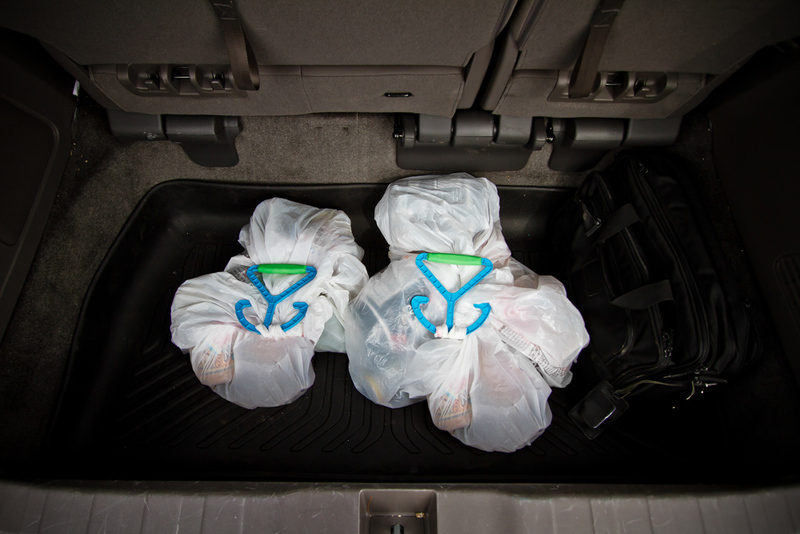 Another cool design feature of the Mighty Handle is that once your bags are where you want them, you can twist the handle twice and lay it down and it sort of closes off the tops of the bags. That's genius! Again, simple, but genius! How many times have I had to deal with groceries spilled all over my car?! Too many to count, but with the Mighty Handle, that's a problem no more! I have been really pleased with this little gadget. I especially like that it is dishwasher safe, 100% recyclable, and MADE IN THE USA! 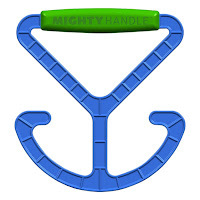 If you want to learn more about the Mighty Handle please visit their website. Hey, that looks like it sure would come in handy for taking care of all those grocery bags! !